Togakure Ryû, the oldest style in the Japanese martial art Ninjutsu, is 900 years old. Ninjutsu was introduced in Sweden by Bo F. Munthe in 1975 and during the early ‘80s, spread throughout the whole of Europe where it has been in existence for 40 years in the meantime. 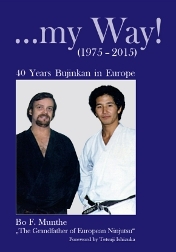 In January 2015, the author celebrated his 40th anniversary with a large martial arts seminar in Stockholm. On the occasion of this celebration, all attendees received the Swedish edition of this book as a souvenir. The book has now also been published in English. Bo Munthe describes his journey in the search for Ninjutsu. He reports about the time when Ishizuka Sensei, on the occasion of his first visit to Sweden in 1975, was guest in Munthe’s house in Trollbäcken, about his first trip to Japan in 1976, his meeting and training with Sôke Hatsumi and the Shihanen, who were active in Bujinkan at the time. The reader also learns several things about the early masters of this martial art who Bo Munthe met during his numerous trips to, amongst others, Japan, USA, England, Germany, Spain, The Netherlands and Greece. The author also tells about the times of the Ninja boom in the ‘80s, an era during which he played an important role in Sweden. In the process, he shares his experiences in the Ninja film business. Format: 16,5 x 23,5 cm, 232 pages, 372 pictures.